Used Ford Ranger Review - 2011-present | What Car? What's the used Ford Ranger 4x4 like? Many may have mocked the early pick-up trucks that were sold in the UK as being a mere pastiche of those sold in America. But as time has gone on, the market for these part family car, part work truck crossbreeds has increased to the extent that they’ve quickly become a part of the motoring landscape. 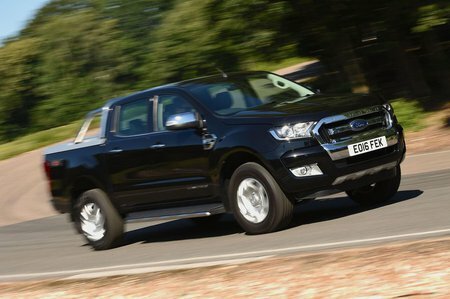 None more so than the Ford Ranger, the best selling vehicle of its type in the UK and one of the most readily available pick-ups on the second-hand market. Unlike rivals such as the Toyota Hilux, the Ranger can be had with a choice of two diesel engines: a 2.2-litre four-cylinder in 123bhp, 148bhp or 158bhp forms, or a 3.2-litre five-cylinder engine with 197bhp. As with most rivals, the Ranger can be had in three different body styles (regular, super and double cab), with or without four-wheel drive. Also in the interests of luxury, you can get a six-speed automatic in place of the six-speed manual. Despite being quite a tall and heavy vehicle, you can hustle the Ranger down the road with a lot more confidence than you can with some rivals. The suspension resists body roll rather well and the accurate steering allows you to place the vehicle in corners with ease. Some potential pick-up buyers will actually be more interested in the Rangers off road abilities, so it’s worth noting that it has one of the best wading depths in the class at 800mm, can clear obstacles of up to 229mm and tackle some pretty steep gradients thanks to approach and departure angles of 28deg and a breakover angle of 25deg. The bed is a decent size, even with a bed liner fitted. Total length is 1460mm and the width is 1420mm at its widest point. At 510mm in depth, it’s deep enough to load up plenty of stuff, but it might not be quite as easy to grab equipment out of the back of the Ranger as it is in a Hilux. Towing capacity is up there with the best at 3500kg, but you have to make sure you’ve got the 3.55 ratio rear axle, because the 3.15 ratio axle can only pull 2500kg. Base model XL Rangers are a bit spartan, but XLT models add heated door mirrors, cruise control, air conditioning and Bluetooth audio. Limited is nicer still; rear parking sensors come as standard along with heated front seats and dual-zone climate control. Top of the range Wildtrak cars have a colour-reversing camera and sat nav.